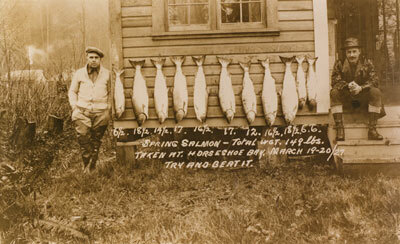 Photo of Fred Brown (L) and another fisherman on March 20, 1927 outside their lodge in Horseshoe Bay displaying their catch of 11 spring salmon. Fred Brown ran a picture postcard business.The writing on the photo indicates the weight of each salmon and says ""Spring Salmon- Total WGT. 149 lbs. Taken At Horseshoe Bay. March 19-2-/27. Try and Beat It."